A similar Ranking for puzzles will be published after we complete 4/5 puzzle tests. We eagerly look forward for the same. Location: India Little delayed - but better than never. Note that the rating system is based on last 5 monthly Sudoku Tests. We'll re-look at the system around beginning of 2011, when we would have more number of tests concluded. They had spent lot of time discussing about the whole system, many arguments and counter arguments. Little delayed - but better than never. Location: India The list is at the extreme left. Its looking a little out-of-place. The list is at the extreme left. Its looking a little out-of-place. Yes. Does not seem to be aligned properly in IE. Location: India Also, for authors/testers, I think NumTests should include the tests they authored/tested. For calculations, it should be ignored. If its too cumbersome, scrap. Location: India Its fine now. Location: India The LMI Sudoku Ratings have now been updated after the very interesting Sudoku Hot Pot. A direct link to the ratings is also included on the main forum page through an icon at the top (next to LMI polls). A total of 206 players from 32 countries are represented in the current ratings. The top 3 overall are Thomas Snyder, Jason V Zuffranieri and Chen Cen. The top 3 Indians are Rishi Puri, Rohan Rao and Gaurav Korde. Do share your comments on the ratings here. Location: USA Now that there have been 5 puzzle tests, can we expect a similar LMI Puzzle Ratings soon? Now that there have been 5 puzzle tests, can we expect a similar LMI Puzzle Ratings soon? Location: India LMI Sudoku Ratings have now been updated after the Renban Group Sudokus.... A direct link to the ratings is also included on the main forum page through an icon at the top (next to Authors). A total of 237 players (an increase of 31 players) from 38 countries (an increase of 6 countries) are represented in the current ratings. Location: India just wanted to know how are the rating points calculated? just wanted to know how are the rating points calculated? The rating is calculated based on a scientific algorithm (and very difficult to explain here), which uses multiple factors (e.g. scores, consistency, # of tests). The maximum possible rating is 1000 and the minimum is 0. Location: Czech Republic It would be nice if you add points change (for ex. +16) in comparison with score from previous leaderboard. It would be interesting to indicate (perhaps with arrows next to the ranking) if the rank of a player is better, worse or equal compared to last ranking (ranking before last test). It would be nice if you add points change (for ex. +16) in comparison with score from previous leaderboard. Location: The Netherlands Wasn't exactly aware there was a rating system. Guess doing a 100 min. test in 50 minutes isn't exactly good for that. At least I should be able to go up with the next test? akash.doulani - 2010-11-18 9:16 PMjust wanted to know how are the rating points calculated? Akash: As Neeraj metioned, there is a currently an algorithm in place for ratings. And, we'll re-look at it periodically, to improve it further. The next review should happen around early 2011. So, if you do have any points/concerns, please share them here, so that we can discuss them while reviewing, and include any valid ones. And, Congratulations for improving your rating by 160 points !!! Both are valid points. This is very much a part of the plans, and you'll see this happen sooner than later. Wasn't exactly aware there was a rating system. Guess doing a 100 min. test in 50 minutes isn't exactly good for that. At least I should be able to go up with the next test? I think your LMI sudoku rating should defintely improve with a reasonable performance in the next LMI sudoku test. And, the LMI puzzle ratings will also be coming up soon. Wasn't exactly aware there was a rating system. Guess doing a 100 min. test in 50 minutes isn't exactly good for that. At least I should be able to go up with the next test? 50 minutes for a test is an exception. Location: India it was a pleasant surprise to see my ratings increase by 160 points. wasnt actually expecting it to improve as much as it did. i guess 360 points is not bad for someone with just two monthly tests under his belt. I like the idea of an arrow. Maybe a green arrow pointing up and a red arrow pointing down. Lets see what we can do. it was a pleasant surprise to see my ratings increase by 160 points. wasnt actually expecting it to improve as much as it did. i guess 360 points is not bad for someone with just two monthly tests under his belt. Congrats for such a gud performance. DreamRose311 - 2010-10-21 1:41 AMNow that there have been 5 puzzle tests, can we expect a similar LMI Puzzle Ratings soon? Finally, the inaugural LMI Puzzle Ratings are up. You can also reach the ratings from the home page, by clicking on Puzzle under Ratings. A total of 359 players from 40 countries are included in the inaugural LMI Puzzle rating list. Apart from India, the top five countries in terms of number of participating players are USA, Germany, Japan, Poland and UK. The LMI puzzle ratings will be updated next in mid-December 2010. Its a neck and neck race for the No 1 spot between Thomas Snyder (motris) and Hideaki Jo (deu). Ulrich Voigt (uvo) is currently ranked third. The top 10 is dominated by the Germans and the Japanese, occupying 8 of the 10 places. Amit Sowani, Rohan Rao and Rajesh Kumar are the top 3 Indians in the list, and the only ones in the Top 50. You can check out the LMI Sudoku Ratings page now. Arrows are now included to indicate the change in rank (from previous rating list). The exact changes in the ranks and ratings are explicitly indicated as well. Looks good. May be an explanation of what the arrows indicate? It looks like a jump of 10+ ranks is indicated by Up arrow. May be an explanation of what the arrows indicate? It looks like a jump of 10+ ranks is indicated by Up arrow. - The green arrow indicates that the player is on the up, and has made major gains (10+) in the ranks as compared to last ranking list. - This arrow indicates that the player has made minor gains in ranks (1-9). - The right blue arrows indicate that there is no change in the rank. - This arrow indiates that the player has dropped 1-9 ranks. - The red arrow indicates that the player has dropped 10+ ranks. So there is no 'major' jump (in either direction) in top20. But I would think that cpickerel and willwc cases are significant jumps. The point i'm trying to make is a jump of 5 ranks in top20 or jump of 10 ranks in top50 or a jump of 20 ranks in top100 should be considered as major. Blue is my favourite colour, so I wanted more of blue . Actually, with the current thumb-rule, it is less likely that we'll see a green or red arrow in Top 20. But I would think that cpickerel and willwc cases are significant jumps.The point i'm trying to make is a jump of 5 ranks in top20 or jump of 10 ranks in top50 or a jump of 20 ranks in top100 should be considered as major. I think you meant a drop for cpickerel. Thanks Rishi. But you have got a very valid point here. Since you want to see a more colourful rating list, we can definitely think of a context based definition of 'major'. Lets have more views on this and we can refine this further. Yes - I used jump for both the directions. drop is the correct word. Location: India As some of you have already noticed, the LMI Puzzle Ratings have now been updated after the two recent puzzle tests - LMI Screen Test 1 and Puzzles & Chess. A total of 223 players from 36 countries find a place in the ratings, including 43 new players. Players who have missed the three most recent puzzle tests have not been included in the rating list. 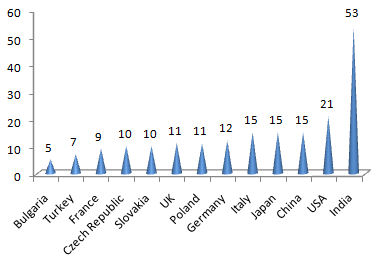 Apart from India, there are 10+ players from USA, Germany, Japan, UK and Poland on the rating list. The top 3 are now separated by only 20 points, comfortably ahead of the next 3. The sorting works the way it does because of the square brackets around the numbers. Rakesh, any reason why the numbers have to be bracketed? The sorting works the way it does because of the square brackets around the numbers.Rakesh, any reason why the numbers have to be bracketed? The square brackets are not necessary. They can be done away with, if that helps in sorting on the 'Change' column. Location: India The LMI Sudoku Ratings are now updated after the December test. Overall, 258 players from 41 countries are included in the rating list now. Location: India The LMI Puzzle Ratings have now been updated after Puzzle Jackpot. A total of 236 players from 38 countries find a place in the ratings, including 11 re-entries and 19 new players. Players who have missed the three most recent puzzle tests have not been included in the rating list. The Top 6 remain the same. motris continues to lead the ratings at 996. The highest gainer has been Alberto who gained 186 points. Amongst the Top 50, pixl has been the highest gainer, gaining 151 points. The highest ranked new player is Valezius at #99. Location: India The LMI Sudoku Ratings have now been updated after the January Monthly Sudoku Test "Prime Exotica". A total of 268 players are included in the current rating list, including 31 new players and 7 re-entries. Thomas consolidated his #1 position with a top performance, and remains the only one with a four digit rating. Rishi lost 34 points but remained in 2nd position. Location: India The LMI Sudoku Ratings have now been updated after the February Monthly Sudoku Test "Double Delight". A total of 231 players are included in the current rating list. WaterlooMathie, the Double Delight winner, continued his rise with a gain of 60 points and 3 ranks. TiiT and bskbri were the two biggest gainers in the Top 100. Location: Canada I notice I'm missing from the rankings now. (I think I've done only one test since November.) How do you determine whether someone is 'active' or not? How long before you get removed? I notice I'm missing from the rankings now. (I think I've done only one test since November.) How do you determine whether someone is 'active' or not? How long before you get removed? If you miss three consecutive tests then your name is temporarily dropped from the ratings. You will again enter in the list as soon as you play another test. Sudoku tests / ratings and Puzzle tests /ratings are totally different entities....and are not mixed together. Further if you have missed two consecutive tests then you will be shown as N... which is an indication that your name will be dropped in the next list if you dont play the next test. Hope to see you back in the next ratings update. All your previous scores WILL be considered while calculating the new ratings. Location: Canada Awesome, thanks. Maybe now I'll have the motivation to do better! Location: India Updated LMI Puzzle Ratings after Puzzle Zoo (February 2011 LMI puzzle test) are now available. Overall, 186 players are included in the ratings, including 14 new players and 8 re-entries. Not much of topsy-turvy.......except a few changes in Top 10. Psyho climbs up to #7, gaining 54 rating points after Puzzle Zoo. Willwc enters the Top 10, gaining 14 rating points. Uvo sitting just behind deu and battling hard to reach the second spot. Rob was the biggest gainer from Puzzle Zoo, gaining 221 points and 113 ranks. Amongst the Top 50, Valezius gained 181 points, and Nyuta gained 95 points. Notable re-entries to the rating list include #19 (Tarotaro) and #40 (ByronosaurusRex). Location: India Updated LMI Puzzle Ratings after Puzzle Hybrids (LMI March 2011 Puzzle Test) are now available. motris (992), deu (984) and uvo (955) occupy the top 3 spots. My Puzzle Rating is not correct. The weighted average of my NS should be 707, my rating is 724, though. Thanks for pointing out this discrepancy. There are no problems with the implementation; however, we did find that your Twist score was completely missed in the ratings calculation. The ratings will be corrected today. OK. We'll include the ratings data (PS/RS/NS) for zero weight tests as well. This is done. Now you can see your normalized scores for even those tests which are not included in current ratings (like EG1). The Puzzle Ratings have now been updated. Also, the sudoku ratings have been updated to rectify one error in Sampler Platter scores. Location: Austria One more request of minor importance. Is it possible to mark those players' names in the result tables who have opted not to be included in the LMI rating? Location: India That is a reasonable request - we should do it in next test. Thanks for all the suggestions, however minor they may be, they certainly are missing. Please don't hesitate to suggest any other things! One more request of minor importance. Is it possible to mark those players' names in the result tables who have opted not to be included in the LMI rating? This is done. You should see * next to the name for players who opt not to include their score in ratings. We'll spend some time checking it manually before making this as default ratings. The most significant change at the top is that MellowMelon moves to #2 position ahead of deu. Also, xevs gained 19 points to have ratings of 919. Location: India Sudoku ratings updated after December Test. motris continues his dominance and retains the top spot throughout the year. No changes in top 3, but MellowMelon inches toward motris. Location: India Puzzle Ratings are updated after Marathon. No changes in top 5. Location: India Also added Ratings History in profile page. TiiT moves to top5 after impressive performances. Among players from India, Prasanna moves into top50 after few good tests. Location: USA zachpuzzle: If you're checking results multiple times while a test is running (i.e. after you've played), those are the players that have played since the last time you checked. I don't think that orange ever shows up after a test is over. Location: India MellowMelon is right. It was not explained anywhere in the forum, and was left as 'another puzzle' for players to figure out. The colors don't appear after the test is over. Location: India Sudoku Ratings updated after Killing Time. There are few swaps at the top. janoslaw and motris swap top 2 positions. Also Kota and TiiT swap 5th and 6th positions. Location: India Sudoku Ratings updated after Sudoku 8X8. No changes in top 5. But lots of swaps after that. Location: India Puzzle Ratings updated after No Numbers. Para moves into top 10. Location: India Puzzle Ratings updated after Seven Samurais. Gaps at the top have never been closer. Location: India With just one week till next Sudoku test and most of us busy with our Sudoku championship, ratings will not be updated after SudoClones. Once Copy Paste is over, ratings will be updated. Location: India Sudoku Ratings updated after Copy Paste. MellowMelon still 5 points behind motris. Location: India Top 100, Yay! Location: India Sudoku Ratings updated after Classics vs. Innovatives. No changes in top 5. Location: India Sudoku Ratings updated after Killer Shootout. motris moves back to top. Location: india hello there!!.. iam a beginner to this sudoku puzzles and i have been solving LMI monthly puzzles since july. How do i get my ratings and where can i check them? is there any prerequisite for entering into the ratings list? Be careful to distinguish between Monthly sudoku tests and Beginners' contests. As far, you have participated in two Beginner's contests, which results are not merged into a cumulative rating. Only Monthly tests' results do, and since you scored 0 in the only one you attempted, I am afraid you will have to score at least 1 point in the next one if you want to appear in the ratings. Once done, this is the page where you will be able to compare yourself with hundreds of players. Or you could also click on your name to see the details of your past performances; there will be a link to the sudoku ratings page (but, again, only once you have scored at least 1 point on a Monthly test). Location: India Puzzle Ratings updated after Borders & Beyond. Interestingly, there are 6 players from Japan in top 9. More importantly, MellowMelon moves to the top position ahead of motris. Location: India Puzzle Ratings updated after 123 GO. With 6 perfect scores out of 12 tests included in ratings, MellowMelon is inching toward a perfect 1000. Location: United Kingdom It seems unfair that Rohan's rating should have fallen by 2 points because he was unable to compete in his own contest. Is there a way of ensuring that the puzzle setter's rating is unchanged? Location: India Well, I think Rohan's points dropped not because he didn't compete 123, rather because he didn't participate in previous 2 puzzle tests (akil oyunlari, Borders & Beyond). Location: India Are monthly LMI Beginner tests included in the ratings? It seems all tests other than monthly LMI beginner tests and some exceptions like "Di..." are included in Ratings i.e. either LMI Puzzle ratings or LMI sudoku ratings, but the LMI Beginner tests are not included in any ratings. Is it on purpose or I have mistaken ? Are monthly LMI Beginner tests included in the ratings? Beginners' contests are not included in Ratings. Di... was an annual contest. By default, annual contests are not included in ratings. In summary, tests under this sub-forum are the ones which are included in ratings. Location: New Zealand Is it possible to have a link to the 'Rating calculations pdf' on the Ratings page? I was trying to remember how ratings worked, and it took me a time to find it in this forum. Is it possible to have a link to the 'Rating calculations pdf' on the Ratings page? I was trying to remember how ratings worked, and it took me a time to find it in this forum. Added a link in the ratings page. Location: India Sudoku Ratings updated after Fugitive Warrant. Kota and deu move up one position each. Location: Slovakia Hi, Fillomino Fillia II is considered to be annual or montly competition? Because it is missing within the puzzle ratings. Hi, Fillomino Fillia II is considered to be annual or montly competition? Because it is missing within the puzzle ratings. Thank you. I was confused because there was no other puzzle test in October. Now it is clear. Location: India Puzzle Ratings updated after Word Show. Para and xevs swap places in the top 5. Location: India Puzzle Ratings updated after forsmarts contest. Location: India Sudoku Ratings updated after Screen Test. Many changes in top 5. Location: India Puzzle Ratings updated. deu moves to 2nd. Among Indians, Prasanna moves ahead of Rohan. Location: India Sudoku Ratings updated. Location: India Puzzle Ratings updated after Puzzle Marathon. Location: India A majority of the top players have gained ratings in this test (I think 44 out of top 50). Is this on expected lines (perhaps because of the nature of this test)? Location: India Sudoku Ratings updated after V2V. No changes in top 10. Location: India Puzzle Ratings updated after Deception. Puzzle Ratings updated after Deception. I've been inactive for some months, but I'm coming back solving and taking part in the monthly competitions. After how many games will my name appear again in the LMI Rating system? It should appear in the next rating update. More details on the rating system are included earlier in this thread. Location: India Missed to post this : Hideaki moved to top in Sudoku ratings after Turkish round. Congratulations Hideaki. Location: India Sudoku ratings updated after Italian round. No changes in top 5. Location: india how i can see my rating points? how i can see my rating points? Once you start participating in the monthly tests, your ratings will appear on the ratings page. As of now, there is no Monthly Test announced because the Indian Sudoku Championship is the next event being held here. But stick around and there'll be a monthly soon. 1. Sum of top 4 four players from a country will be considered their Team score. 2. Score of Players from the same country who are not in top 4 will be ignored for team score. 3. For the countries where less than 4 players participate, sum of their scores will be team score. It will encourage them to get more players from their country to give test to get better Team ranking. This is just an idea. First thing is that this should be technical implementable easily. If yes, we can discuss further on this or may be start a new thread. Location: India Puzzle Ratings updated after DTGT. Location: India Puzzle Ratings updated after DWBH. Location: Indonesia I have a suggestion regarding the "pink table" on profile pages. Can it be moved to a new page, that also lists the values of N, L, U, K, Kp, and which tests are considered and how much weight for each (like Player C in the sample)? It helps cleaning the somewhat cluttered profile page, and it can display more information. In fact, if my assumption of how the table is displayed behind the stage is correct, the new page can simply have a copy of the current table, and the current profile page can have the last four columns removed. The main task would be to display a new "weight counted for the rating" column, plus computing N/L/U/K/Kp values. ^ Yeah, mostly because of laziness computing by myself. I have a suggestion regarding the "pink table" on profile pages. Can it be moved to a new page, that also lists the values of N, L, U, K, Kp, and which tests are considered and how much weight for each (like Player C in the sample)? It helps cleaning the somewhat cluttered profile page, and it can display more information. In fact, if my assumption of how the table is displayed behind the stage is correct, the new page can simply have a copy of the current table, and the current profile page can have the last four columns removed. The main task would be to display a new "weight counted for the rating" column, plus computing N/L/U/K/Kp values. Sounds like a good suggestion; so will get it done. It might take a while, because not all information is handy in the database. In the meantime, ratings updated after ST4 and deu continues his top rank. I now have the exact same rankings as I did in the WSC and the WPC. deu now has Rank 1 in both puzzles and sudokus. Wanted to know how are the rating points calculated? Location: India Check here and here. Location: Netherlands Are the Sudoku ratings going to be updated after Road to London? Are the Sudoku ratings going to be updated after Road to London? On the Road to London topic, there's a notification from the Admin that it'll take a few days. Location: New Zealand New puzzle ratings are up after the Pento Parade test. Wow, I see William Blatt jumped up 10 places from 24th to 14th. And he didn't even compete! (Arguably) if he had competed he might have got a lower rating, because this test had a top score well ahead of the main pack, which means everyone gets a lower score than they otherwise would. As discussed for other competitions, basing the score for the top half of the field on the overall best score gives a wide variety of results, meaning different tests get different distributions of final scores. Location: India Thanks for bringing this point up, James. Yes. That's correct. Ratings can increase if (a) you do very well in the most recent test, OR (b) you had a bad performance twelve months ago (which goes out of rating calculations now) but have since done ok. Generally, we tend to correlate rating improvement with the first of these reasons, which is natural but not a complete view. LMI Rating system (Puzzles) takes into account performances over the last 12 rated puzzle tests, which roughly means twelve months. William had a (relatively) lower rating so far because of his (arguably) inferior show in the Forsmarts Anniversary contest 2013, where he was ranked 37th out of 108 non-zero scorers. In the latest ratings, he got rid of this baggage. And due to relatively stable performances over the last twelve months, his rating has improved and come close to his actual recent performances. I would say, "the rating system waited for a fair number of improved performances before registering an improvement." And, since he has not been a regular participant (yet), the rating has potential to improve further. I can see some analogy to FIDE ratings (chess), where it takes time to reach your actual rating levels. Your argument is valid since willwc has played less tests in the recent twelve month period. For a more regular player, this argument is not valid. For example, if he had performed as well as you did on Pento Parade, he would have still reached a rating of ~833 to be 17th, a jump of 7. And, if he had got more than ~1140 on Pento Parade, he would have bettered a rating of 845 also. But, in general, yes, NS on this test would be lower because of the exceptional top score. Agree with your point. This point has been discussed while devising the ratings formula. Also look at this post from motris summarizing the discussions around this. I am not saying we cannot make changes. But "Is an improvement needed for handling such tests with outlier performances?" is the question. Also, you can refer to this earlier post. In the example, player D resembles willwc. So we take a straightforward weighted average of his NS to get to his rating. Location: The Netherlands You can make a similar argument for Neil as he only has 4 tests. But because two of his tests are marathons, where the PS is much higher for the top puzzlers compared to other tests, his rating average is much better. Location: India Updated ratings after Irregular Variations. Location: turkey Hi! Why do you list only the first 300? How can I find myself in the rating lists? Hi! Why do you list only the first 300? How can I find myself in the rating lists? After some impressive performances in last 5 sudoku tests, Kota moves to the top position. There has been a lot of sudoku tests these times, but few puzzle tests ( only Pentoparade in october and Forsmarts in december ). Can we know when the next puzzle tests are planned ? Puzzle Ratings are updated after Puzzle Marathon. Location: India Sudoku Ratings are updated after Unlucky 13. Only three points separate the top 3 - jaku111, Kota and deu. Also, for authors/testers, I think NumTests should include the tests they authored/tested. Thanks for the suggestions. You may also refer to the post - http://logicmastersindia.com/forum/forums/thread-view.asp?tid=119&s... for more details on the rating calculations. Couldn't have been more coincidental. Thanks for sharing. Location: India When will the ratings be updated incorporating the SM Round 1 results? Location: India The ratings shall be updated very soon. Location: Italy What means "very soon"? Location: India Apologies for a long delay in ratings update. The Puzzle and Sudoku Ratings are now up to date after Evergreens PR test for puzzles and Odd Even/ Substitution SM test for sudoku. The top 3 in Puzzle ratings are Endo Ken, Hideaki Jo and Kota Morinishi. For India, the top 3 has Prasanna, Rohan and Amit. The top 3 in Sudoku ratings are Jan Zverina, Kota Morinishi and Seung Jae Kwak. For India, the top 3 has Rohan, Prasanna and Rishi. Location: India The Sudoku Ratings are now up to date after Maths SM test. Kota is now #1, Nikola is now #12 and Tantan is #17. Location: India The LMI Puzzle Ratings are now up to date - after the Casual and Word PR test. Neil moves up 6 places to #6, Walker moves up 4 places to #5 and Bram moves up 2 places to #8. Location: Indonesia Can we have the link to the ratings placed somewhere visible from the main page, just like the top bar has a link to this thread? Can we have the link to the ratings placed somewhere visible from the main page, just like the top bar has a link to this thread? Location: Indonesia Whoops, by main page I meant the main page of the forum, because it's almost exclusively the page I visit. But that's better than nothing. Whoops, by main page I meant the main page of the forum, because it's almost exclusively the page I visit. But that's better than nothing. Main page bottom right has the links. Location: India The LMI Sudoku Ratings are now up to date after SM6. Tiit is now #4, Wendy is now #16 and Kota remains #1 (gains 2 points). Location: India The LMI Puzzle Ratings are now up to date after PR6. Location: USA Will ratings be updated for the most recent PR/SM tests?